The web is increasingly filling up with ads. Many sites, including this one, have a bunch of them all around with the hopes that you’ll find one relevant to you, and click on it. Of course, most of you don’t. And if you do, it may be by accident. As you can tell, I’m not exactly bullish on the model. But the problem is that there are few alternatives. Contenture is trying to offer one. The service has been getting some buzz over the past few months, but mostly because no one seemed to know what the hell it was all about. An email today finally revealed their model. Contenture wants to be the “anti-ad network.” What it means by that is that it wants sites to adopt their monthly-fee based network to offer visitors the option to do things like turn off ads. Yes, this would basically turn your site to the subscription-based model. But there’s a somewhat interesting twist. Contenture wants to sign up a bunch of sites to this model and have users pay one flat monthly fee to have access to all of these sites. That money would then be distributed to all of these sites. These sites could determine what Contenture subscribers get as a part of their subscription. Some may lose the ads, some may have special commenting ability, etc. A similar model has been tried by the likes of TipJoy and others, but grouping sites together and offering users a place to pay one-fee for multiple sites is interesting if nothing else. 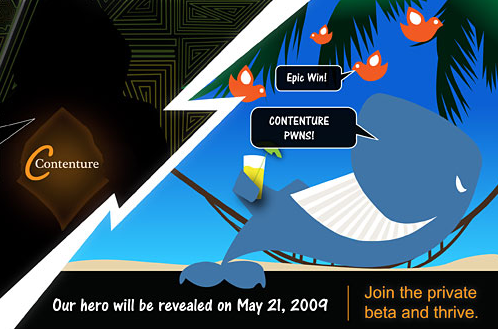 Plus the site has a comic homepage that features a drunk Twitter Fail Whale and makes fun of its competitors. That’s pretty cool in our book. The service is still in private beta testing, but apparently it’s getting ready to launch on May 21. Disclosure: This morning for four hours Contenture sponsored our CrunchCam.